The Polsen Omnidirectional Lavalier Microphone OLM-10 records hands-free audio to both channels of your camcorder or DSLR, as well as to most devices with a 3.5mm mic level input that cannot supply phantom power. This self-powered clip-on electret condenser mic is designed for accurate voice reproduction in home and video webcasting applications such as presentations, interviews, dictation, and corporate video. 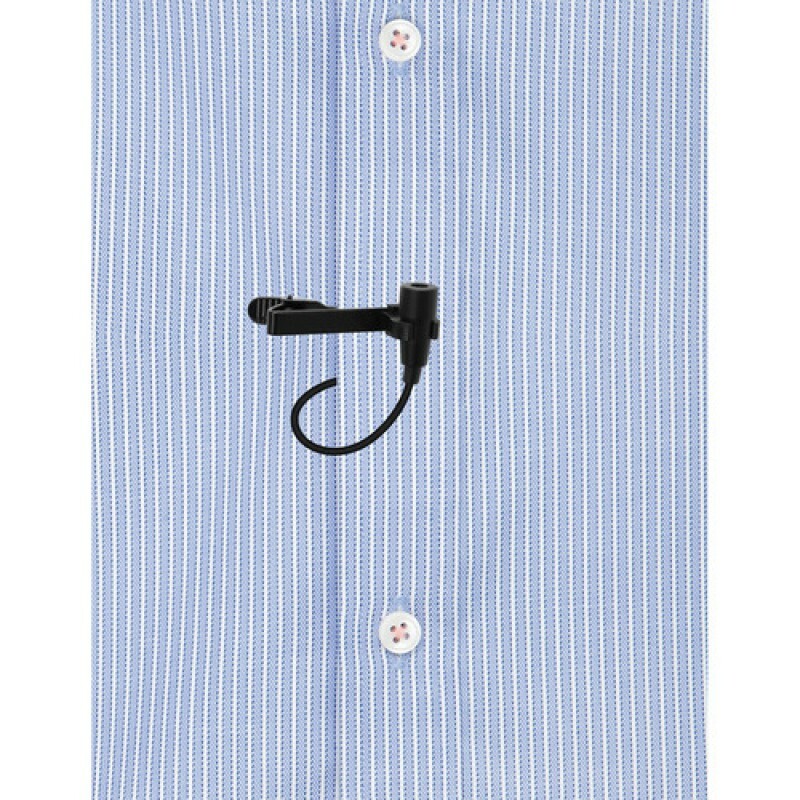 A small, 21mm-long lightweight body allows for discrete placement with the included tie-clip and a 20’ long cable gives you plenty of distance from your recording device. 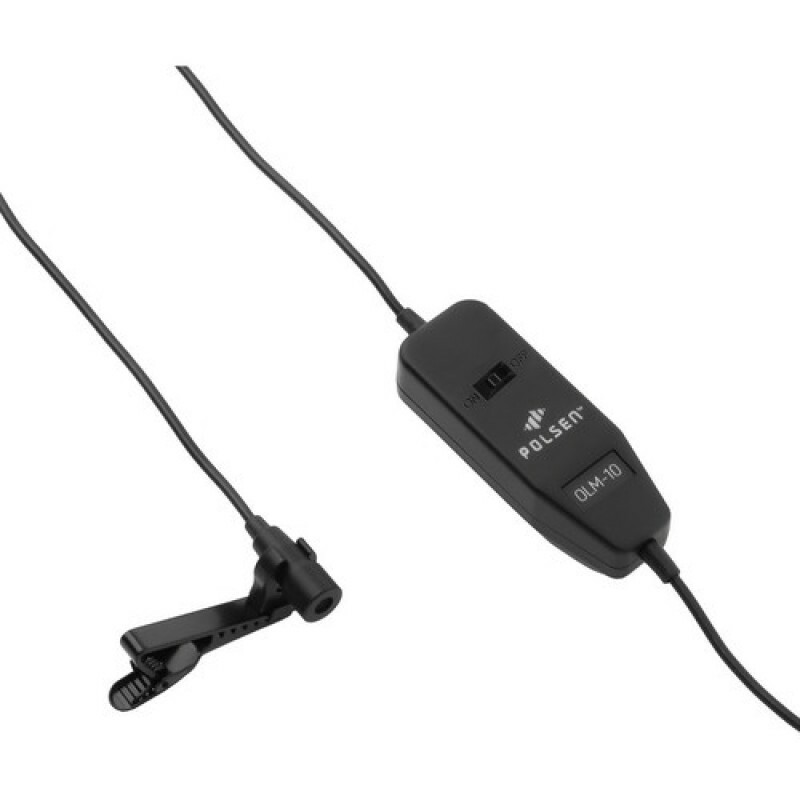 With a 3.5mm dual-mono TRS output connector, the mic sends audio to both the left and right channels of your recorder. The omnidirectional polar pattern provides a uniform response that will not create the bass-boosting proximity effect common with cardioid patterns, while allowing you to move freely without off-axis rejection causing a drop in volume. The in-line power switch allows you to quickly mute the microphone as well as preserve battery life when not in use. 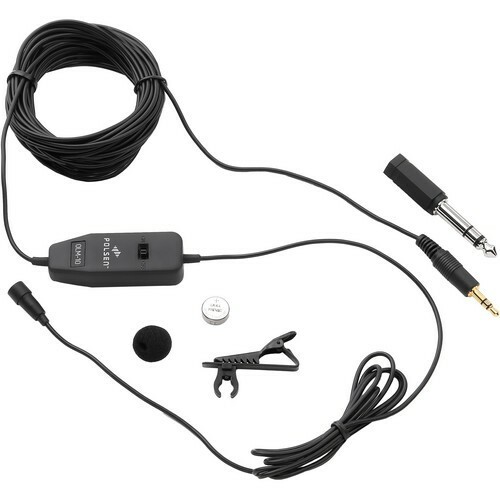 A windscreen for reduced noise and plosives, a 1/4" adapter, and an LR44 battery are included. Box Dimensions (LxWxH) 7.2 x 4.6 x 1.0"
I use this with my Cannon 5D and so far I have not had any trouble. The audio is clear and while the cord is a bit thin I haven’t had any trouble with hiss, something that I had to deal with on the mic I was using before this one. I would recommend this mic over anything else at this price level though if you are singing or need that kind of audio quality I would spend more money on one of the high end mics out there. I have been using this microphone with a Sony HDR-UX7 to film home videos and to work on a small homemade movie I’m filming. Given the things I need from a mic this one is satisfactory. Obviously, if you’re someone whose focus is audio quality I would recommend a more expensive piece but for the most part this mic will do the trick. Low price and pretty good quality. I have been using it with my Canon XA10 and I haven’t had any troubles. This mic is good but it gets 4 stars because of its high value after the low price is considered. If you need professional grade audio than I would not recommend this item. For everyone else this is a quality piece of equipment which won’t cause you any trouble that can’t be fixed with a bit of post editing. All things considered, I would say I got more value than I paid for. The wire is thin so I needed to edit some hissing. The mic will pick up background sound so the right distance is important. The battery pack does not have a battery life indicator. Aside from these small issues it is a very practical mic and at this price I am giving 5 stars. As a videographer for a large marketing firm I often interview employees and customers for our ads. I must say I was pretty surprised when I received this mic given I am usually provided pretty expensive equipment (1000+). However this mic does everything I need it to do and the quality can be compared with that of mics five times the price. The only complaint I ever saw was about the length of the cord but I don’t get why some people think this is annoying I find it is more a convenience than a problem. Overall, this mic is a great buy and capable of making high quality productions. Before I bought this microphone I was using the ATR 3350 which was only okay even though it coasted me a few more bucks so when I bought this I wasn’t expecting much. To my surprise this mic performs incredibly well. As a journalist I mostly work in areas with lots of ambient background noise but it still does not let too much in. Overall sound quality is amazing and the volume is not too high and not too soft. The only problem I could think of is the large cord length, threading twenty ft of cord through my shirt was obviously not fun because it could get all tangled up. I would recommend making a few loops or winding it up a bit and tying it down with a piece of Velcro. Once I did that it completely stopped being annoying. And of course there were also plenty of times where the extra length really came in handy. In general this is a great piece of equipment and for only $25 it’s definitely the best price you’re ever going to see for a high quality microphone. A few days after I picked up this mic I accidentally placed my rolling chair right on top of the battery pack and being a pretty heavy guy sitting down marked the end of its very short life. It performed pretty well on my first day of testing so I shelled out a few more dollars for another one and I am glad to say I was not disappointed. This is a killer microphone and I would definitely recommend it.